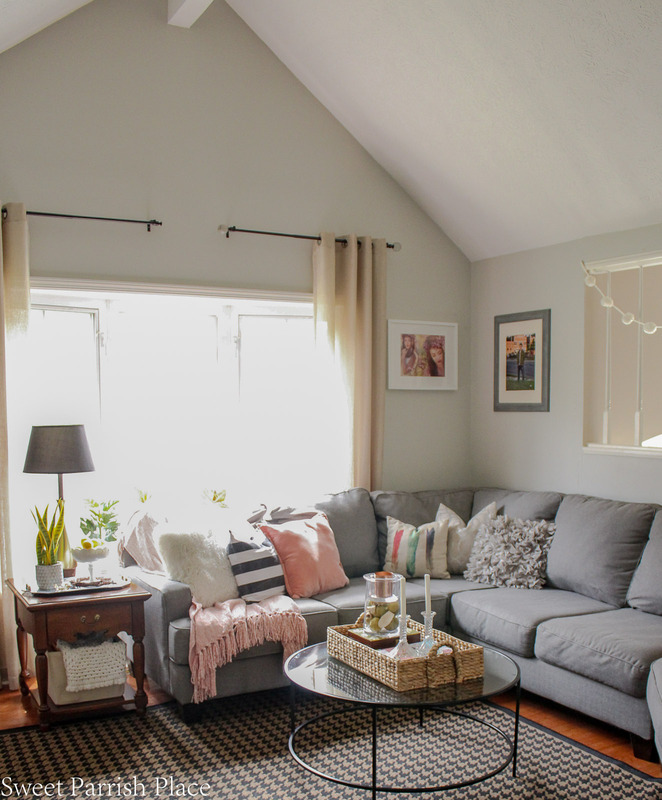 Today I am sharing my 2019 spring living room as the second of three Spring Home Tour posts that I have planned. Hey friends! I hope you are having a good week! We are leaving for a trip to Disney World tomorrow morning and we are so excited! If you have any recommendations for things we won’t want to miss while there, please let me know in the comments of this post! 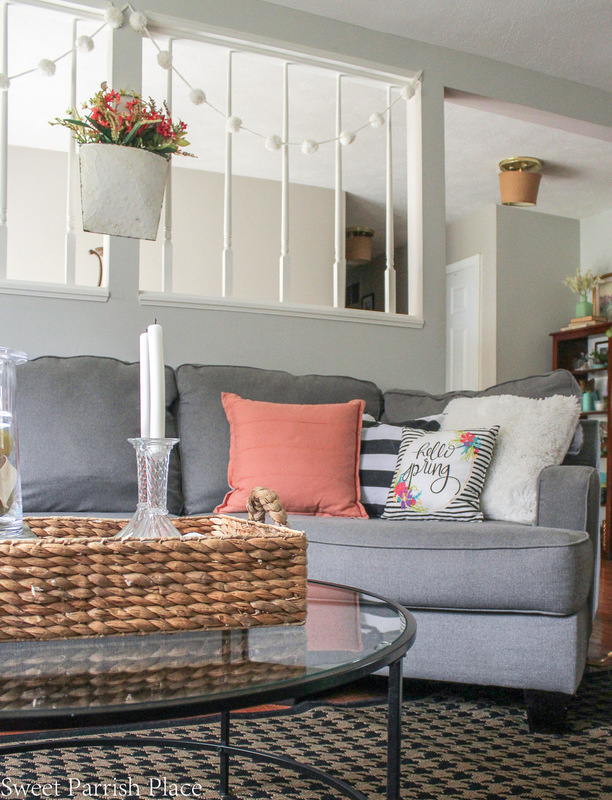 So before we leave for our trip, I wanted to pop in and share our colorful 2019 spring living room. and have I told you lately how honored and thankful I am that you come by and read my blog? I love each and every one of you who take the time to pop by my little space on the internet! and if you are new here, welcome! Please take some time to browse around and find out what Sweet Parrish Place is all about! I love having you! I recently changed up the gallery wall in our living room. It was time, ya’ll! I just wasn’t feeling it anymore. 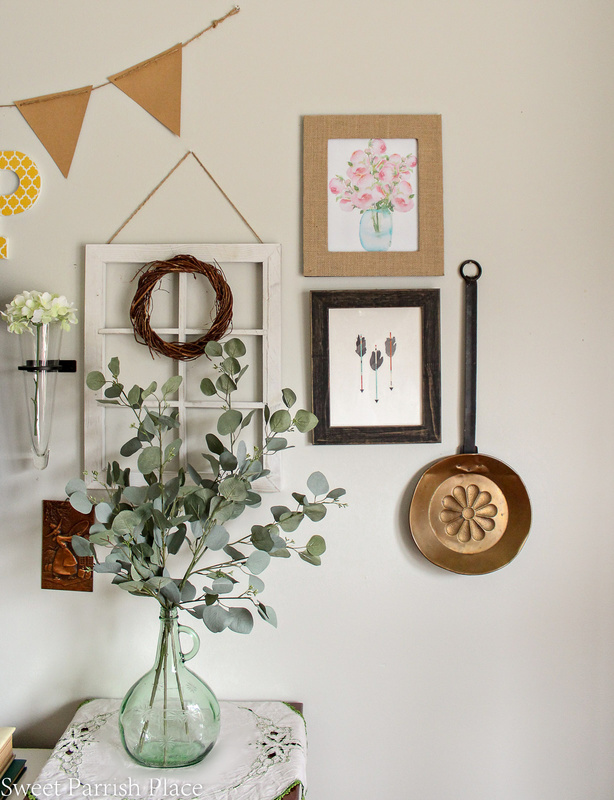 Since we have given our kitchen and our dining room/ office some updates recently, I just felt like the old gallery wall was not fitting in with my current decorating style. 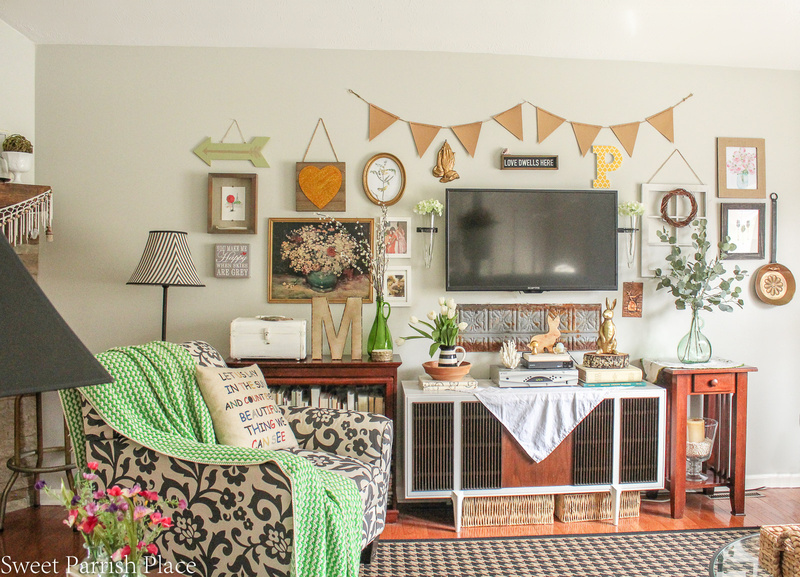 So I wanted it to have a more cohesive look with where things are going with the style of decor in our home. 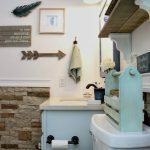 I will probably write a more detailed post that focuses specifically on how I changed out this wall to fit our design style more, but today, I am sharing it on the blog for the first time! I hope you like it! I kept some of the items that were already on this wall, and I took some away. I also added a few new items. Two of the new ones are the burlap frame you see above, and the vintage inspired window. The window is something I bought recently at Walmart. I looked but was unable to find it online. They do have these in stores though, and it was pretty cheap too. there is no glass in it, but I thought it was really cute. You can find them back in the unfinished wood crafting area, near the fabric. At least that is where I found mine. 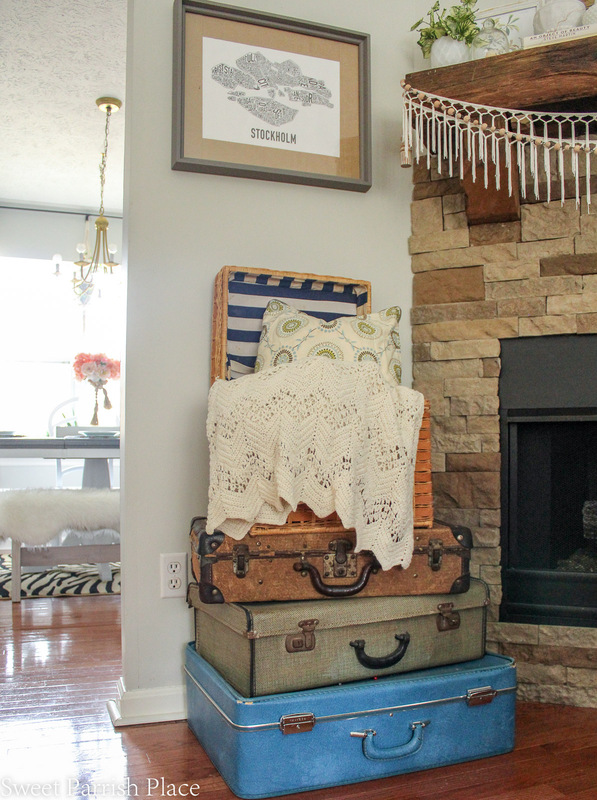 I added some printable art I found online to the burlap frame. 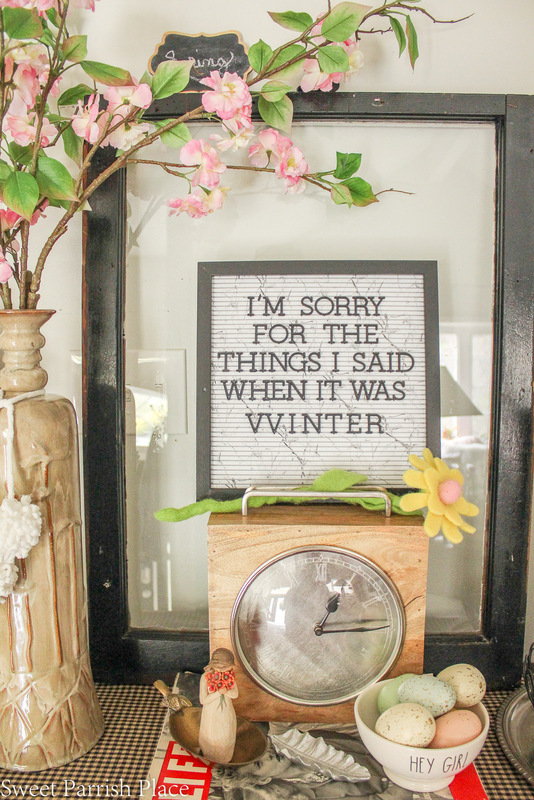 I love finding printables to use for seasonal decor. You can see a whole collection of printable art that I like at my Printables Pinterest Board. I really want to paint every piece of dark furniture in this entire room. Actually what I really want is new furniture, but that is not gonna happen. So while I am waiting to get time to put all of the painting of all of the furniture on my list, I decided to turn all of the books around on this bookcase you see below. I felt like having the white book pages staring back at me, instead of the colorful spines, helped to neutralize this area and lighten it up, which satisfied me for now. I love to buy tulips in the spring! 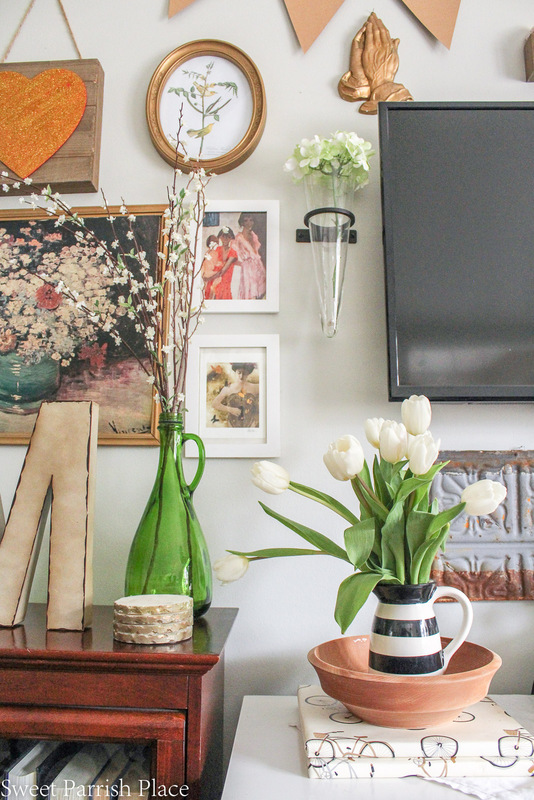 Tulips are my favorite flowers, so my husband brought these pretty white ones home to me so I could have fresh flowers in my home tour. Wasn’t that sweet of him? I decided to use some of my milk glass collection to decorate my mantel for Spring this year. 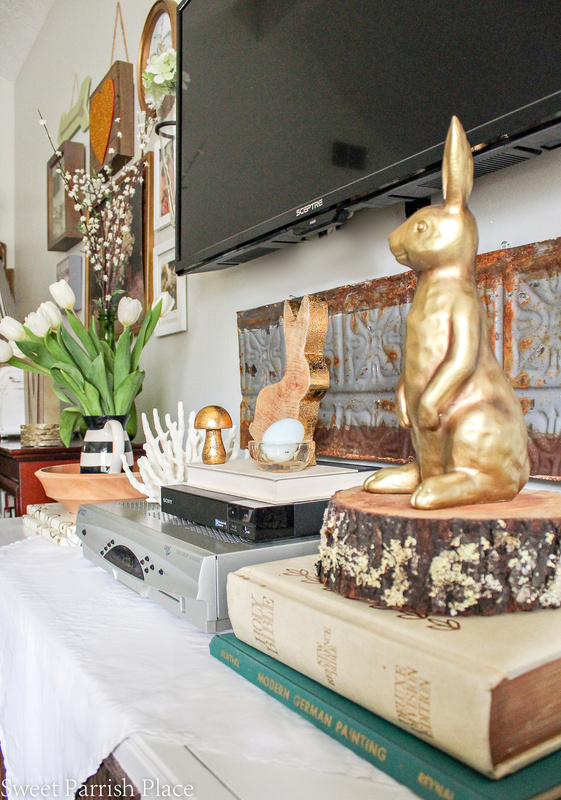 I added in a few white bunnies, a couple of framed botanical prints, and some greenery. This feels light and simple to me. 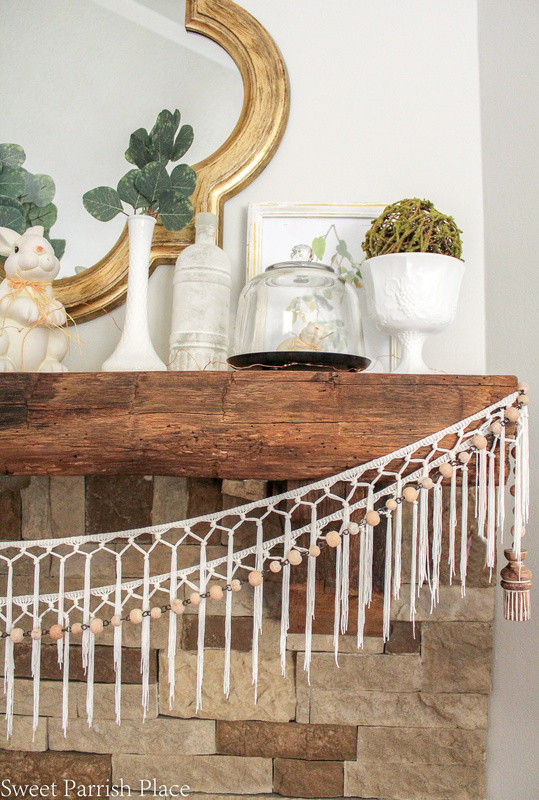 I really like the way my mantle turned out this year for Spring! 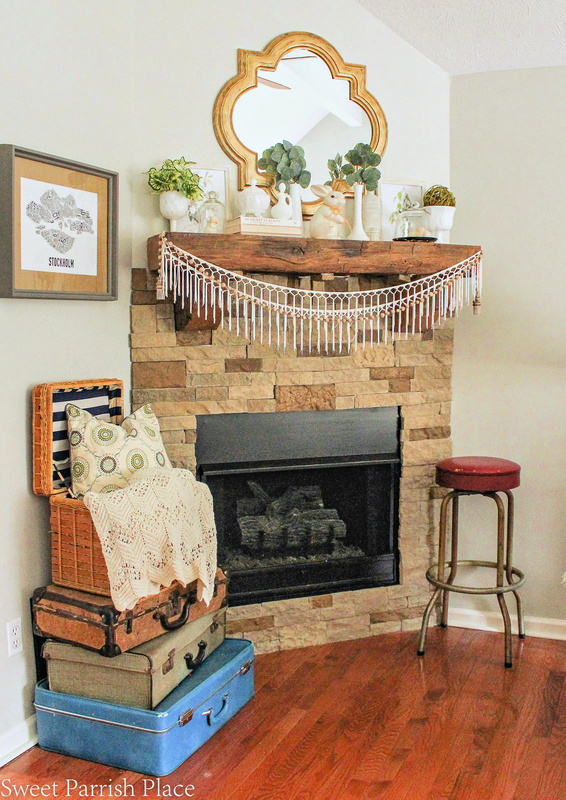 You can read all about this fireplace transformation here, it was one of the first projects I focused on when we moved in. this fireplace used to be just a black box in the wall. The macrame fringe is from Hobby Lobby, I just measured how much I wanted and had them cut it. And then on top of the fringe, I added a wooden bead garland that has cute wooden tassels on each end. 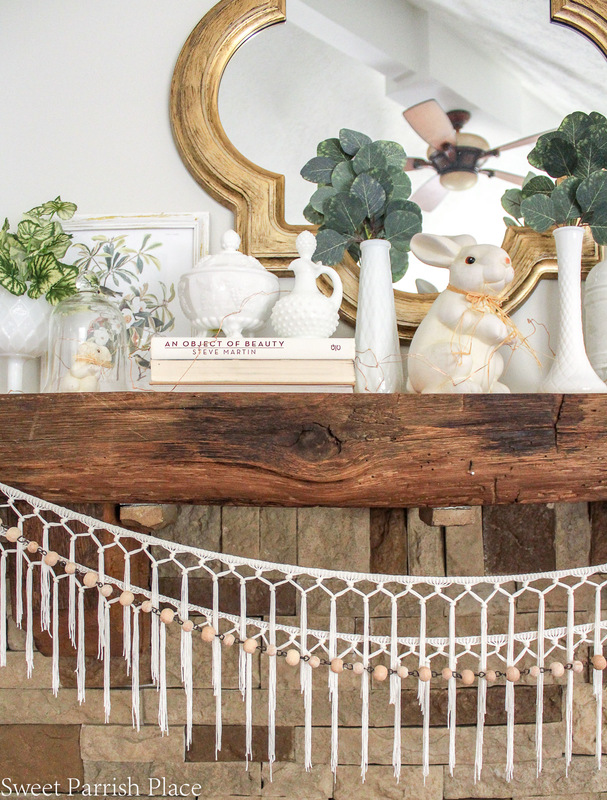 I really love this wood bead garland because it has a white washed sort of look. 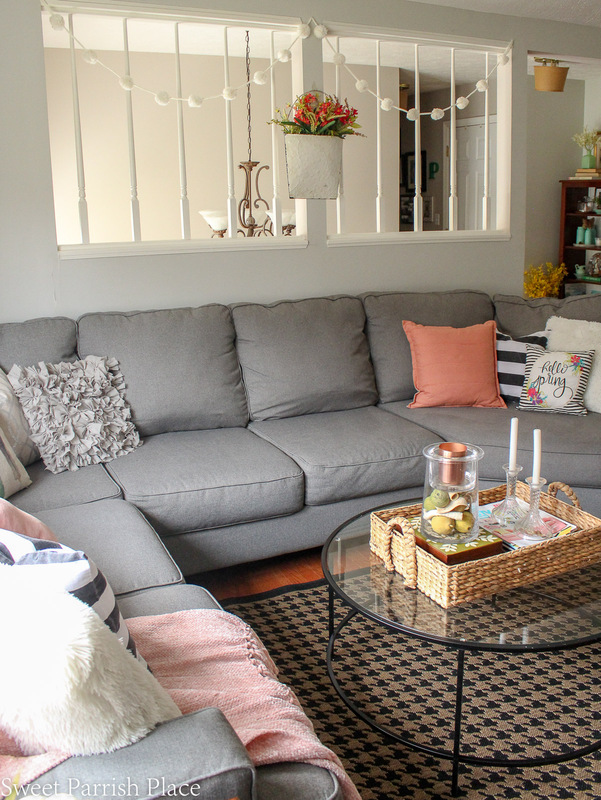 This sectional sofa is a few years old, from The Ashley Home Store, and it is holding up great! We do a lot of television and movie watching right here in this spot. The only difference is that it usually is covered with blankets and has no throw pillows on it because we have a dog. And our dog and throw pillows do not get along. 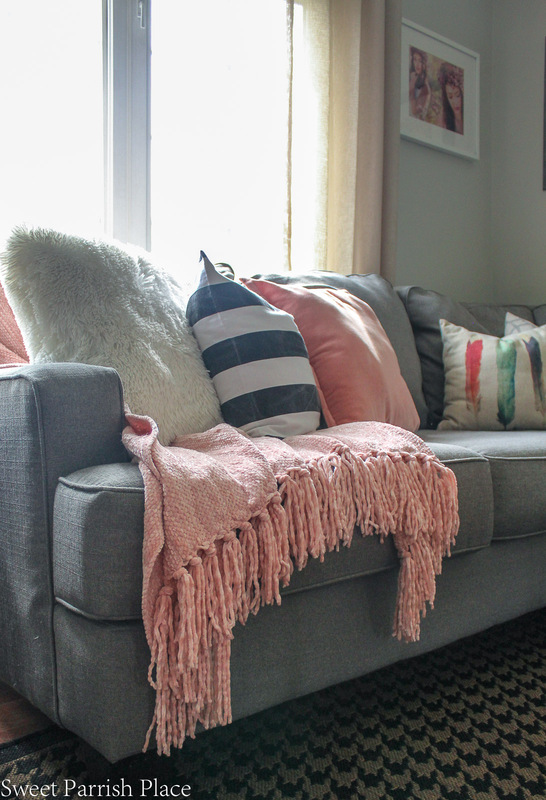 I actually didn’t even purchase any new pillows for Spring decor this year because they end up in a box and only seeing the light of day when we have guests. 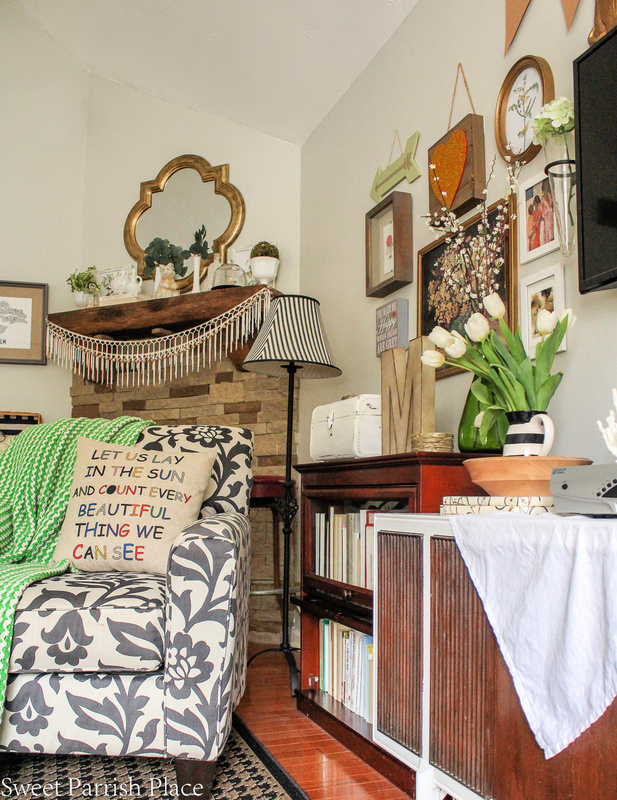 So I just pulled from my own stash this year to add some pillows for my 2019 Spring living room tour. 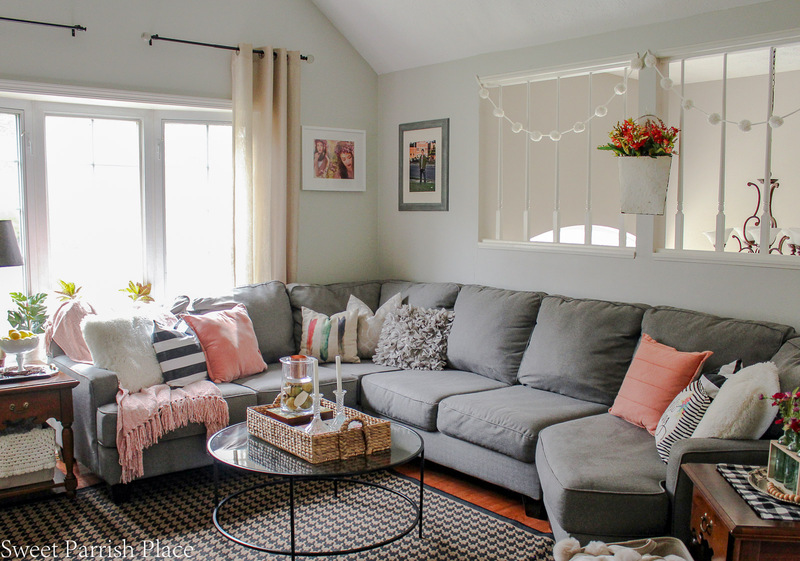 I added this little bucket full of Spring blooms and this white pom pom garland in this opening over the sofa. I actually bought the pom pom garland at Hobby Lobby at Christmas time, and used it in my Christmas decor, but it is good for Spring too! 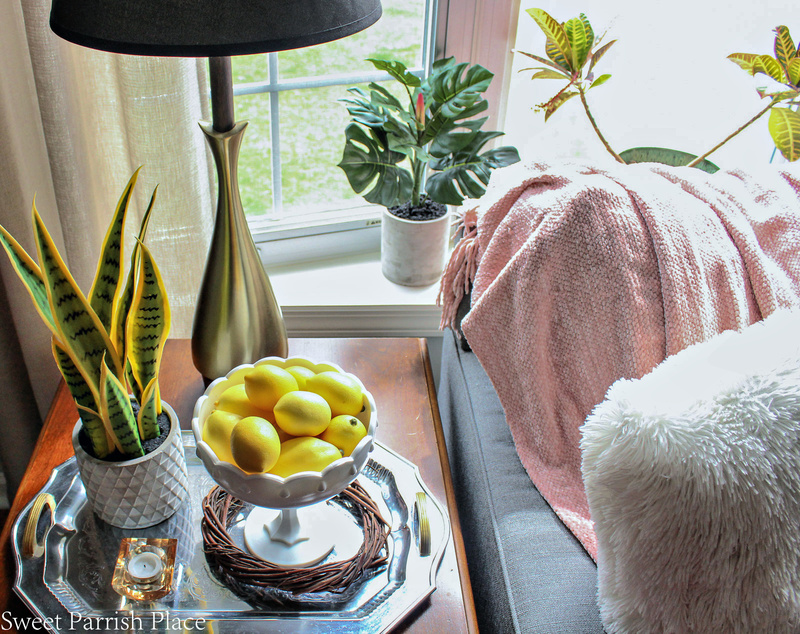 I love to add a bowl full of lemons to my Spring and Summer decor every year. It just cheers me up. These are not real lemons, but they do look pretty realistic! And they look pretty in my white pedestal bowl. You may have noticed that I used a silver tray on each of my side tables. 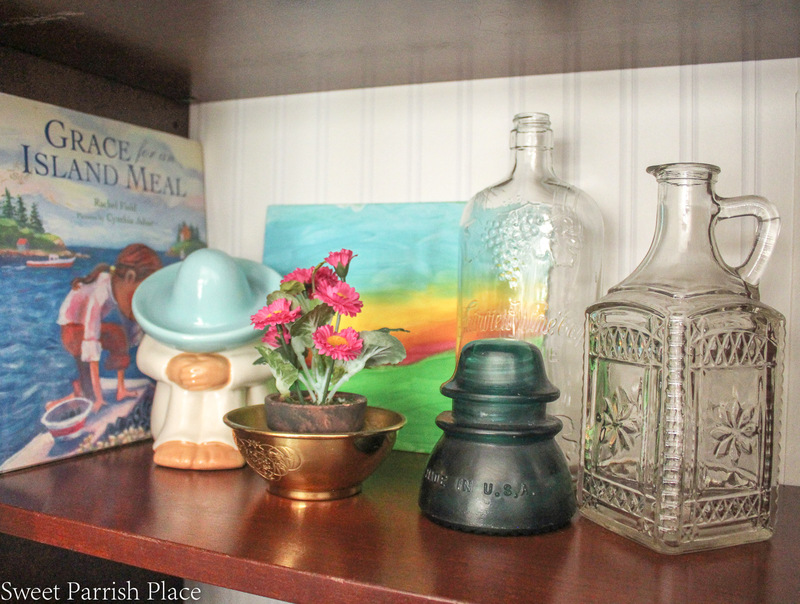 I love to pick up trays like this at thrift stores and they just add a layer of interest to your decor. 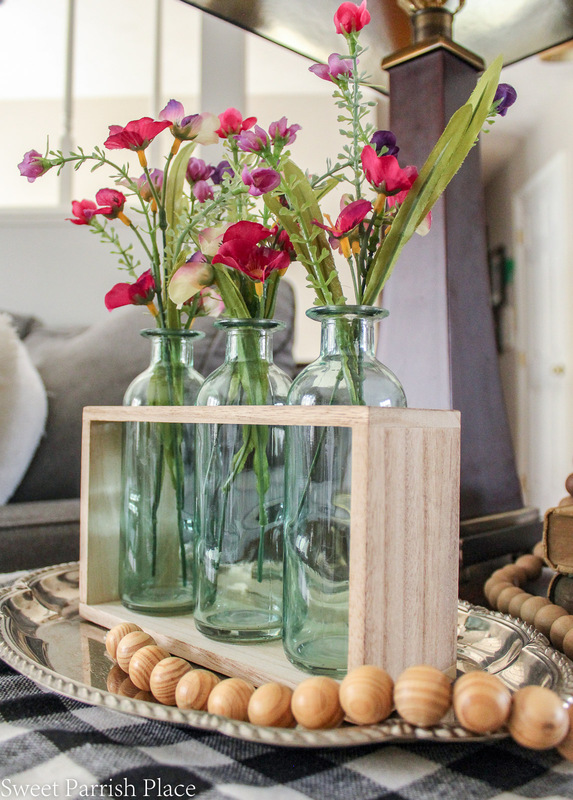 These items would probably look cute without the tray, but adding the tray under helps you to group things together, and just adds that little bit of interest and bling that wasn’t there before. You will notice below that I also have a plaid place mat layered under this particular tray. This adds just another layer of interest. It also hides the side table that is scratched to hell, HA! Below, you see yet another side table that I want to paint. This particular sofa table is part of a set of three, my two end tables match this. these three pieces are getting serious side eye from me. I will paint them one day. They are nice solid wood furniture that I have owned since 1995. I hate to get rid of solid wood pieces, but they just do not fit what I want anymore. so I do plan to give them a makeover at some time in the future. I think I can give them a whole new life! What do you think I should do with them? I am actually thinking of stripping them and bleaching the wood or something like that. I would love to know your ideas! Can you catch the quirk here in the letter board I have displayed? There is something not quite right on the board, do you see it? It’s VVinter!!! I ran out of W’s, and I used to VV’s to make the W in winter, hehe! I didn’t realize this until I went to spell winter, and I was too lazy to come up with another idea, so this is my way of improvising. Yet again, here is another bookshelf that I am dying to paint! 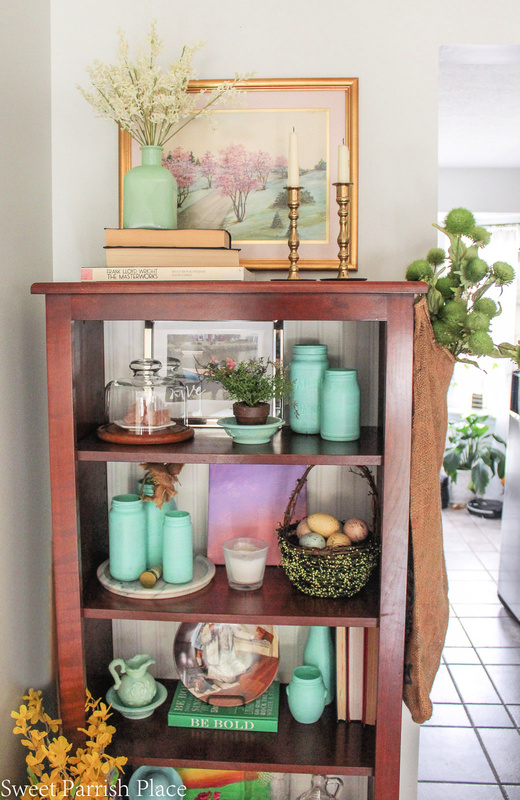 I actually did start doing a little makeover on this bookshelf before I started decorating for spring this year. I decided to add some bead board wallpaper to the backs of the shelves. I had some left over from our mudroom makeover we did a couple of years ago. So I was able to add this to the shelf backs in no time at all. Nest up will be painting this piece, but I have not decided on a color yet. This bookshelf sits right at the top of our stairs, and you can see it from the front door, so I always like it to look pretty. The white bead board wallpaper helped to lighten up this piece enough for me to live with it for awhile longer, but it will be getting a paint job soon. 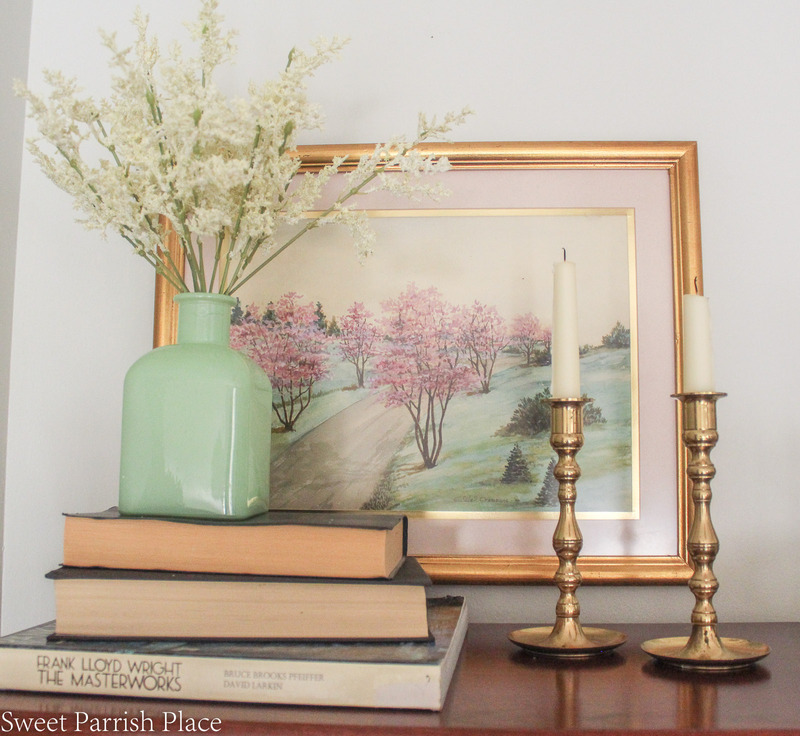 I picked up this vintage art at a thrift store and I think it is so perfect for my Spring decor! the two brass candlesticks are also thrift store finds. I always look for brass items when out thrifting, because baby, it’s back! all of the sea glass green jars were a DIY project I did with some jars I had saved. I decided to split them up and display them on different shelves all in the same bookcase. I thought they played well with the art above. I also added a couple of small canvases that are leaning against a couple of the shelves. these were painted by my daughter, and she loves it when I display art that she makes! 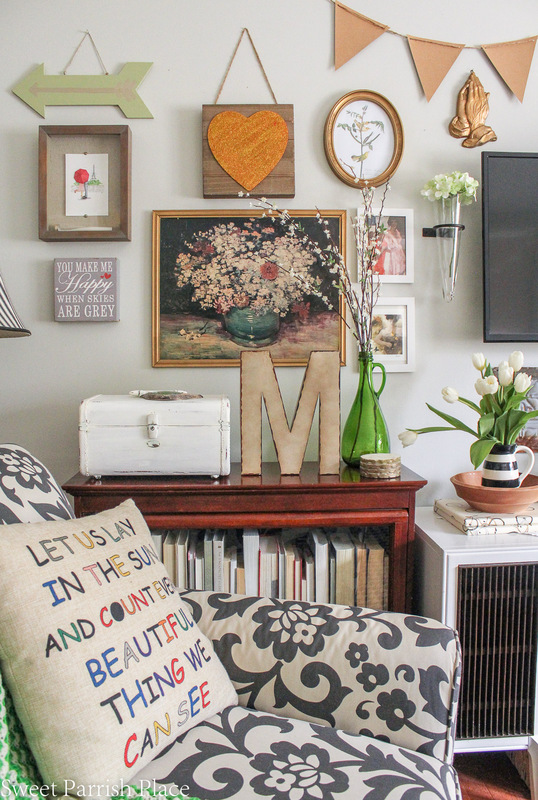 This bookshelf is filled with a mix of thrifted and collected treasures. Time just constantly gets away from me, I swear! 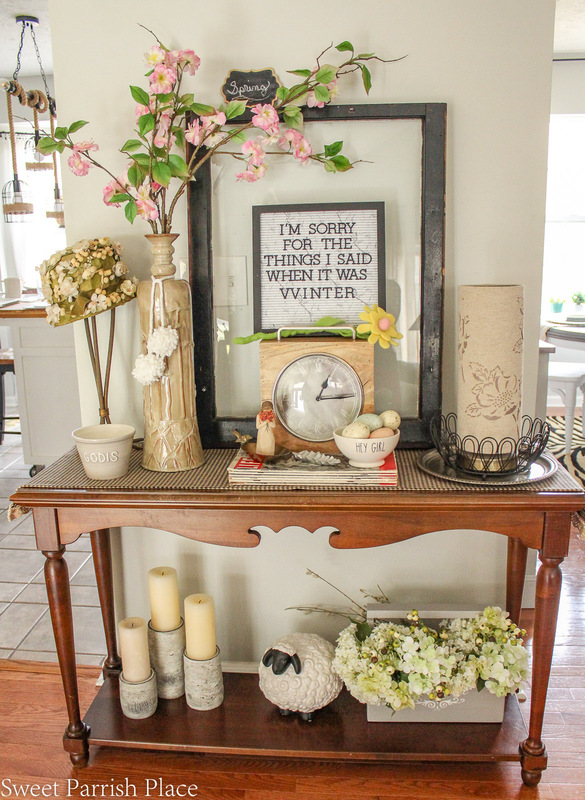 I still have my Spring dining room and kitchen to share with you guys. I was hoping to get them out on the blog before we go on vacation, but at this point, I am hoping I can get these published after our vacation. 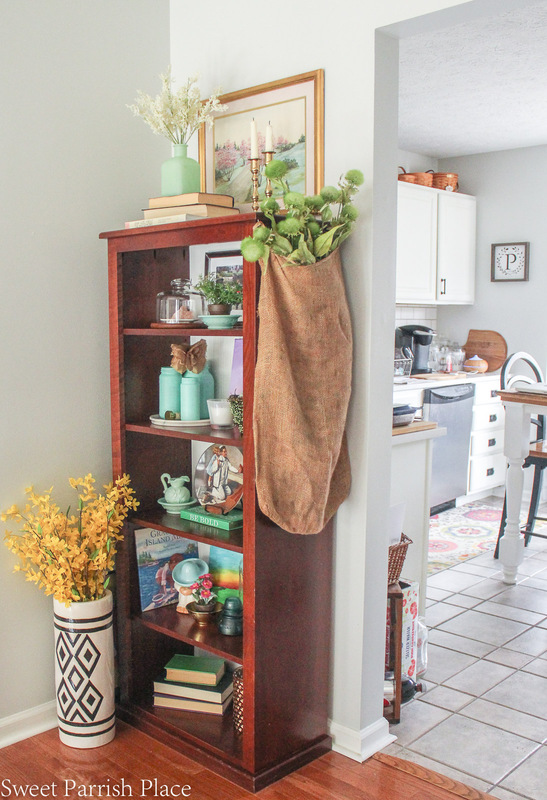 So hopefully I can share the last part of my 2019 Spring home tour with you guys either late next week, or right after Easter. 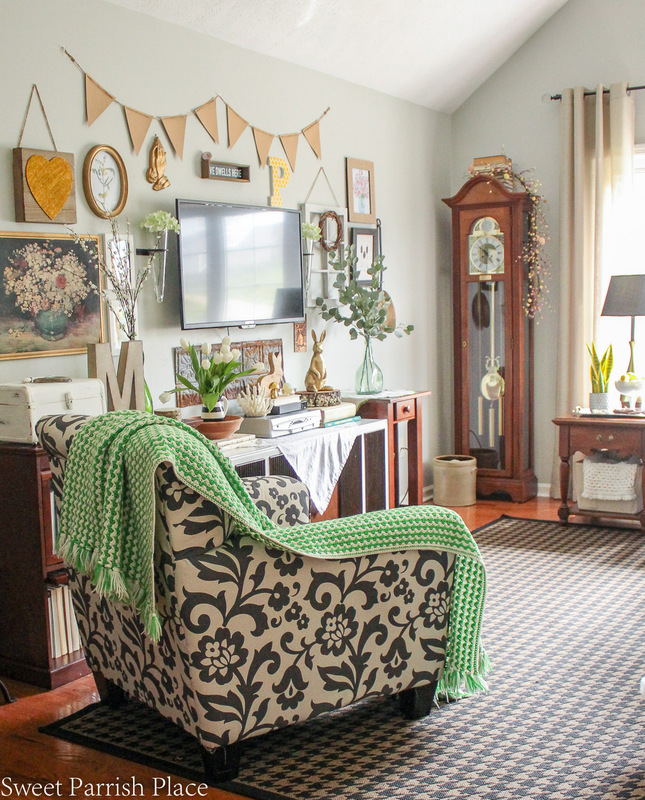 Thank you so much for join me today for my Spring living room! I won’t be around here again on the blog for most of next week, but you can come over to Instagram and join me if you are interested. I am sure I will be sharing snippets of our Disney vacation over on my Instagram stories all week! I hope each of you have a very happy and blessed Easter!